The Mario Cervo Archive is the most important collection in the world devoted to the music of Sardinia. 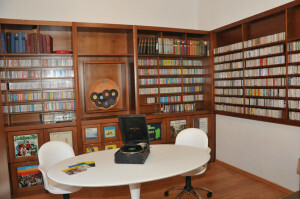 The archive contains most of the phonograph material published, inherent to the Sardinian traditional repertoire, recorded between 1922 and 1997. It includes more than 6000 catalogued supports and sorted by the ethnomusicologist Paolo Angeli: a job made possible thanks to the intervention of the Regional Institute for Ethnography. The material contained in the Archives allows us today to make a thorough research on what happened musically in Sardinia in 1900. The Archive’s core is about traditional music in different genres, such as the “canto a chitarra” (a canto in Sardinian language or Gallurese dialect, accompanied by a guitar), the “gara poetica” (poetry competition based on improvisation), the “canto a tenore” (choral folk singing, characteristic of Barbagia), the “canto campidanese” (a canto in Campidanese dialect), melody played with Launeddas (a typical Sardinian woodwind made of three pipes), “tasgja” and “canto a concordu” (choral folk singing, characteristic of Gallura and Logudoro, respectively), and other instrumental chants and dances. But there is also room for the sounds that accompanied the washerwomen to the river, to the “heterodox” sounds of an ivy leaf used as a reed, for the stories of the great interpreters of the 30s to Radio Sardinia, for the trumpet of an auctioneer, and for all the sounds and words that catered for a century, the concentric movements between rural, village and town life marked by the agricultural calendar. The constant research of Mario Cervo has documented the history of traditional Sardinian music, leaving us also the pages of a different music that over the years has been folkorised and Italianised in the texts. Creating an archive centred on the island and its music, Mario Cervo gave birth to a single set in which we can contemplate the music made by the Sardinians, inspired by their land. Rejecting all forms of segregation and ideological closure, he gave us an unbiased view of what happened musically over a century. The Archive is open then to modern musical experiences such as pop music, jazz and rock. Forms only apparently unrelated to the musical history of Sardinia. Even in the Nuraghe editions, produced by the same Mario Cervo, the two souls live. To the same catalog belong the song “Welcome to Costa Smeralda”, which evokes the birth of the tourism industry in Gallura and, at the same time, the best pages of guitar song in the Post-war period, where the extraordinary singers such as Mario Scanu and Cicchèddu Mannoni express feelings and values of an agro-pastoral world that will disappear in a few decades. This was the music that Mario Cervo really loved. To this music he dedicated his record productions and its simultaneous fieldwork, documenting the most important phases of the traditional song related to socio-cultural changes taking place in Sardinia. Mario Cervo, through its record editions, has been actively involved in tracing the history of a music at the time too young to arouse the interest of ethnomusicology. Besides the precious recordings of 1922, it is possible to access to hundreds of unreleased tapes, thousands of articles supporting the audio parts, as well as modern forms of Sardinian poetry related to rap music, and again, shouting punk noise against a militarized and cementified Sardinia. This is history too. And it is only by knowing in depth the Sardinian culture of the last century and the social reality in which we live that we can understand what are the micro-elements that make our traditional music, so repetitive and minimal to the ear of a stranger, deeply rich and unique.